Well, until the middle of July at least. I took this photo at the demo garden on Tuesday, documenting our spring-planted lettuce, which still looks like lettuce instead of like towers of bolted reddish-green with yellow flowers. Does it still taste like lettuce? Up till last week, it did – this week we decided not to harvest because the flavor was getting bitter, instead just leaving it to look pretty (hey, there are aesthetic qualities to lettuce, and I don’t have anything ready to grow in its place yet). But yes, you can have lettuce in July. What’s the secret? 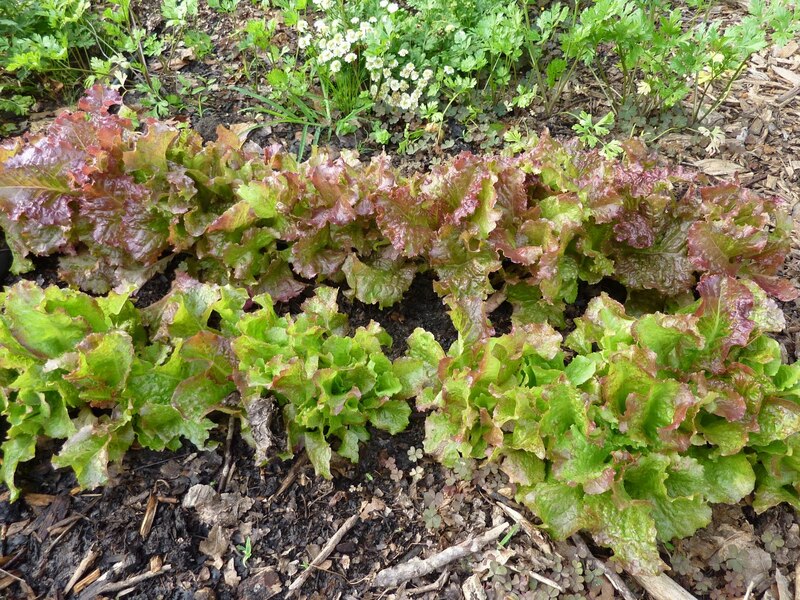 First, the lettuce bed gets morning sun and afternoon shade, which helps slow the bolting. All-day filtered shade would work even better. Secondly, I chose varieties that claim heat tolerance – these are Rouge Grenobloise and New Red Fire, but others work as well: read the catalog descriptions and select wisely. Judicious regular harvests would probably help as well, though what these plants got was an occasional razing when I arrived and said, “What? Still lettuce? This won’t last another week!” and cut it all to the ground. My experiment at home, growing June-planted lettuce in between tomato plants in raised beds, worked pretty well too, although I’ve had to discontinue harvests because the lettuce is between tomato plants and therefore I can’t reach it. Better planning next year will help with this issue. If anyone manages to get their lettuce edibly through 100+ temperatures this weekend, I’d love to hear about it. All three of my lettuces have either bolted or turned bitter in the extreme heat. Are you starting new plants to set out in a few weeks when the weather cools? I'm planning to direct seed in the shady area in mid-August, and (with some artificial shade, maybe) in a bed over which I can place a cold frame when it gets chilly. Which sounds wonderful right now. Lettuce sown in salad boxes at the Home and garden Information Center on July 18 was up July 20. The salad boxes are in indirect sun light. The seeds were lightly covered. Jon, this is when I wish I had a second salad table (gotta get on that). Mine is still full of New Zealand spinach and basil (with the two bush bean plants, from which I've had about seven beans!). Hmm, my (late planted) lettuce hasn't grown a bit it seems for weeks but the tiny little leaves remain tasty with lots of watering over the weekend. The ones right by the fence seem a bit perkier, perhaps because of the shade. Water and shade seem to be the way to go!